Moving right along through our list of the obstacles, we arrive at Obstacle #4: It’s Harder Than Ever To Sell Professional Services. OK, maybe you’re skeptical. You may ask, “Really, harder than ever?” I promise, it’s not intended as hyperbole. Not that anyone’s feeling sorry for attorneys, accountants, and marketing consultants making six-figure salaries, but let’s dissect this topic a bit further and see what you think then. The history of selling professional services can be neatly divided in the two periods: Pre-1977 and everything after. I’m 99% certain nearly all of you reading this have never heard of John Bates. Or, the 1977 Supreme Court case of Bates v. State Bar of Arizona. Let me explain. For nearly 100 years prior to 1977, professional associations (such as accounting, law, medicine, etc.) erected stringent rules against commercial behavior. In three professions-accounting, actuarial, and law-an absolute prohibition existed against anything resembling selling activity. On the claim of the violation of free speech, the Supreme Court in 1977 ruled in favor of Bates and O’steen, stating that Arizona’s ban of advertising “inhibit[ed] the free flow of information and ke[pt] the public in ignorance”. The Supreme Court therefore removed the ban on advertising in law. This ruling changed everything in the fields of professional services. Prior to this ruling, marketing of professional services took place on the golf course or over drinks after work; the ‘good ol’ boys’ network. This tidy little system made sure that prices stayed relatively high and uniform – a gentlemen’s agreement on what to charge clients for services rendered. When Bates and O’Steen came along, fresh out of Arizona State University law school, they began advertising a low, and flat rate, for straightforward legals services like wills, setting up corporate entities, etc. Bates and O’Steen were smart and hungry, eager to get their legal careers off the ground. Unfortunately, the good ol’ boy network didn’t take very kindly to their approach – which was viewed as unseemly and in poor taste. Professionals didn’t advertise or sell! Work was based upon who you knew and prices were never discussed. Nowadays, every accounting firm, architect, attorney and web developer advertises. And, sells, too. Even if they don’t call it such. Adding to the growth in advertising and sales for consulting and professional services, we also have had a significant increase in the number of individual providing those services; ergo, more competition. For example, as you’ll see in the first graph below, the # of attorneys relative to our U.S. population remained steady for nearly 100 years from 1880 to about 1970. 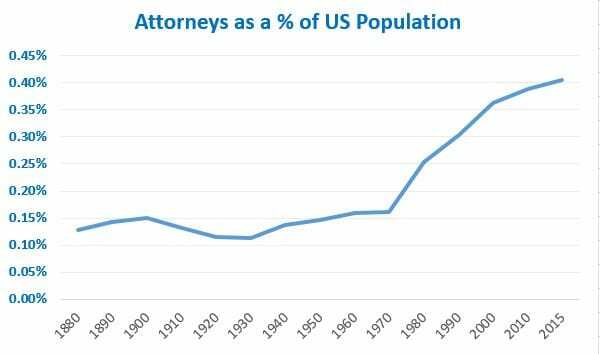 Since 1970, the number of attorneys in the U.S. has more than tripled as % of our population. 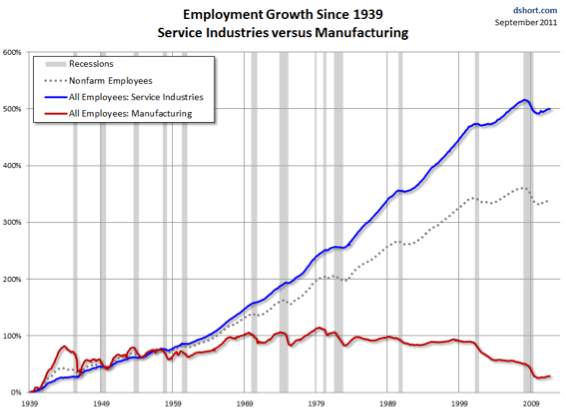 Taking a look at the services industries as a whole, our second graph shows the cumulative growth of the service sector of the economy versus manufacturing since 1939. Not too surprising, right? The gap between employment in the manufacturing sector of the economy and services began to spread in the 1960s. Now, this includes all services – not just consulting and professional services, but I think its fairly safe to say that the competition among all service providers has increased significantly over the past 50 years. Judging from the number of billboards in my town for doctors and lawyers, I think its sure bet there is more competition than a few decades ago. Let’s take a look at a quote by Jack Trout, a leading marketing expert and co-author of positioning theory. When do you think Mr. Trout made this claim? 2015? 2010? 2000? 1990? Would you believe 1969? Even before the era of smart phones, the internet, email, social media, or the 24/7 news cycle, we were already overwhelmed with ‘too much noise’. Fast forward 50 years and every living consumer in western society is numb from the unmitigated onslaught of advertising messages. When Jack Trout first made this claim, the average American consumer was exposed to about 500 ads a day. By the early 2000s, this number had grown to an estimated 5000 ad messages a day. Today, marketing experts estimate that many among us are exposed to as many as 10,000 ads a day. I find these numbers incredulous. Really, 5000 to 10,000 ads a day? Even at 500 I think my brain would hurt. Independent of the actual figures, I think we can all agree that we are ‘overwhelmed with unwanted advertising‘. At some point, advertising becomes meaningless. Background noise. OK, how are you feeling now? Ready to go out and win some new clients? Frankly, the thought of it all is a bit overwhelming to many of us. I’m a bit more optimistic. Because in this sea of nonsense therein lies great opportunity for those that understand how client’s today actually buy consulting and professional services. But, we’ll have to wait a bit longer for that. Next up is our fifth and final obstacle: Obstacle #5: Everything You’ve Ever Been Taught About Sales Is Wrong.